1Departamento de Botânica, Universidade de Brasília, Campos Universitário Darcy Ribeiro, Asa Norte, Brasília, Distrito Federal 70910, Brazil. 2Laboratorio de Fisiología y Biotecnología Vegetal, Universidad de Santiago de Chile, Facultad de Química y Biología, Casilla 40, Correo 33, Santiago, Chile. With 29 Km2, the Fildes Peninsula is the largest ice free area in King George Island and probably in Antarctica. The region is house of six permanent bases including the only airport in the South Shetlands, which led to impacts on its original landscape and vegetation. In recognition for the need to protect natural values, an Antarctic Specially Protected Area (ASPA 125) was established in the region. Focused mostly on protecting the fossils, the ASPA also plays a role in protecting the vegetation but so far, the management plan for the area does not contain a list of moss species present there. We provided an updated study and checklist of mosses present in ASPA 125. A key to species identification and photographs of main morphological features are also available in this paper. Also, six new occurrences are reported for Fildes Peninsula. Considering the scarce knowledge about specific local floras in Antarctica associated with highly impacted area, of which only a fraction is protected, it is suggested the necessity to invest in detailed sampling studies, as well as in a better understanding of the local floras interactions in Antarctica. The Fildes Peninsula (62°08’ to 62°14'S and 59°02’ to 58°51′W), located southwest on King George Island is the largest ice free area in the South Shetland archipelago. Its vegetation is composed by mosses, lichens and only two species of flowering plants [Deschampsia antarctica E. Desv. and Colobanthus quitensis (Kunth) Bartl.]. The first and only comprehensive checklist of mosses for the region listed 40 species , including Ardley Island, but not much is known about species distribution and conservation status. Fildes Peninsula is also probably one of the areas with higher human impact in the South Shetlands, as it houses six permanent Antarctic Bases (Chilean stations Escudero, Frei and Fildes, Chinese station Great Wall, Russian station Bellingshausen and Uruguayan station Artigas), plus many refuges and modules. Dirt roads also exist connecting them, where you can also find an airport and a small village (Villa de las Estrellas), which includes small facilities like houses, postal office and a school. Due to its proximity with South America, the area has become a major hub for tourism, logistics, scientists and whoever is coming back and forth from Antarctica. This leads to a high permanent concern on the negative impacts of such activities and how to comply with the environmental protection protocols in the region. During the IV Antarctic Treaty Consultative Meeting (ATCM) in 1966, an area of 1.8 Km2 in Fildes Peninsula was chosen to be protected. It was originally designated as SPA 12, and is now the Antarctica Specially Protected Area 125 (ASPA 125). Fildes Peninsula also houses another nearby ASPA in Ardley island (ASPA 150), created in 1991 . According to Annex V of the Environment Protocol, an ASPA is created to “protect outstanding environmental, scientific, historic, aesthetic or wilderness values, any combination of those values, or ongoing or planned scientific research” (ATS 2016). The ASPA 125 was created due to its unique fossil composition, being probably the area with higher paleontological importance in Antarctica (ASPA 125 management plan, 2009). The region is divided on eight different regions or zones labeled as ASPA 125 a-h.
As the main goal of the area is to protect its fossil richness, not much has been done in order to better understand its floristic composition. As a result, the area management plan does not provide a list of the plant species present in the area, but only mentions the presence of 40 species of mosses, 175 lichens and 2 flowering plants. However, this list actually refers to a study area at the Fildes Peninsula and Ardley  and not to the ASPA at all, as a consequence the number and species composition of ASPA 125 remains unknown. In this study we provide a list of all moss species occurring in Fossil Hill (ASPA 125a), providing a key to its identification and general comments for some taxa of the moss flora of the Fildes Peninsula. Fossil Hill (ASPA 125a) is located at the south center of Fildes Peninsula, it is easily accessible by both Chinese Station and Chilean bases. It has an area of about 0.568 Km2 (ASPA 125 management plan, 2009), and its higher elevations are ca. 130 m a.s.l. . The area includes two main elevations: Büdel Hill and Fossil Hill. ASPA 125a is the second largest zone after ASPA 125c, which is the buffer zone surrounding the Bellingshausen glacier dome, but it presents a more heterogeneous habitat and has marked altitudinal gradient. Material was collected during the austral summer of 2017. Collections were made with the use of knife or by hand following the recommendations of Schofield . Species were identified with the use of proper literature, especially Ochyra et al. . Vouchers are preserved at herbarium UB  and classification system follows Goffinet et al. . Since there is no record of mosses specifically for the area, the list (Table 1) and key presented here are based solely on our own collections. 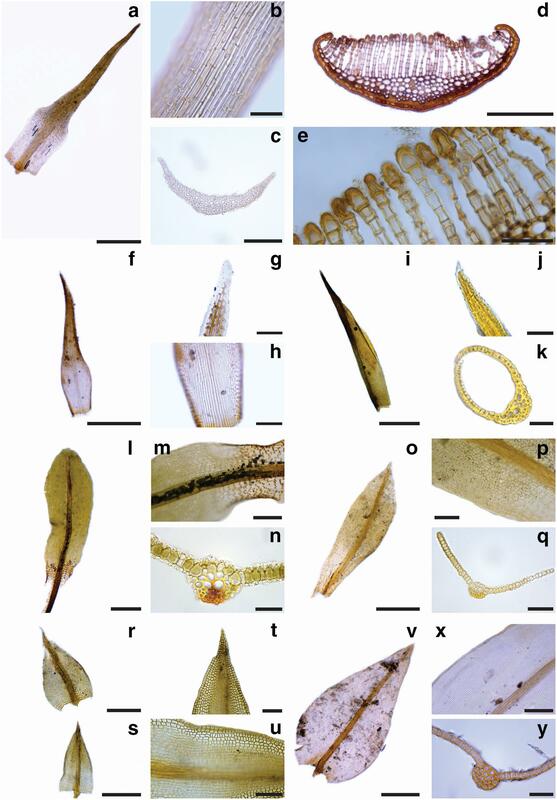 Specimens were dissected and important morphological characteristics were photographed under light microscope using a coupled camera to capture the images. Those were edited and assembled in two plates to illustrate the species (Figs. 1 and 2). We used the checklist provided by Peter et al. and compiled data from Ochyra et al. as base for the list. We also checked for taxonomic updates, novelties and errors, resulting in the exclusion of some names. After that, we added data from our collections and updated the list for Fildes Peninsula (Table 2), following the classification system of Goffinet et al. . For the family Pylaisiaceae, we followed the current concept of Câmara et al. .
Brachythecium austrosalebrosum (Müll. Hal.) Kindb. Bryum orbiculatifolium Card. & Broth. Bryum pallescens Schleich. ex Schwägr. Bryum pseudotriquetrum (Hedw.) G. Gaertn., B. Mey. & Scherb. Chorisodontium aciphyllum (Hook.f. & Wilson) Broth. Polytrichum strictum Menzies ex Brid. Twenty-one species divided in thirteen families of mosses are recorded for the ASPA 125a site (Table 1). This represents about 41% of what is reported for the Fildes Peninsula  and about 18% of the whole Antarctic moss flora. Considering the relatively small area of the site, it shows its high importance and the relevance of the site in protecting the vegetation. 3. Leaves strongly concave, ovate-lanceolate with acute to long-acuminate apex …. Brachythecium austrosalebrosum….. According to data presented here, together with previous reports for the same location, there are 48 species of mosses divided in 17 families in the Fildes Peninsula (Table 2). This represents about 43% of all mosses known to Antarctica . It was only reported in Fildes for lake Kitiesh, but it is much more widely distributed in the Peninsula, including areas like Chilean Collins refuge, Uruguayan base Artigas, Fossil Hill and Chinese station Great Wall and its surroundings, being actually quite frequent. Putzke and Pereira  also reported it for Fildes, but the exactly location was not mentioned. Unfortunately we did not have the chance to study this material. This species is not mentioned by Ochyra et al. as occurring in Fildes Peninsula. We also did not collect it during our expedition and its report was maintained since it is present in Peter et al. .
Schistidium urnulaceum (Müll. Hal.) B.G. Bell. This species is not mentioned by Ochyra et al. as occurring in Fildes Peninsula. We also did not find any sample of this taxon on our collections. Like C. magellanicum, it was maintained based on Peter et al. .
Mosses are the second largest group of land plants, second only by Angiosperms . In Antarctica, where there is only two species of native Angiosperms, mosses are the dominant vegetation, being present in both continental and maritime Antarctica. Mosses are well known as bioindicators and for producing chemicals with pharmacological potential . Unfortunately, not much is known about its ecological role and conservation status, especially in Antarctica. Very few ASPA management plans have a comprehensive list of moss species in their area, limiting more complex studies regarding the group in these places. Fossil Hill with only 0.568 Km2 contains almost 20% of all moss diversity in Antarctica. The Fildes Peninsula with about 1400 Km2 contains 43% of all moss diversity in Antarctica. The knowledge of these areas continues to expand, as six new occurrences were found in this study. The low level of understanding of the local flora associated with a highly impacted area of which only a fraction is protected highlights the necessity to invest in broader and detailed sampling studies, as well as in a better understanding of the floras in specific areas, both protected and not. Antarctica is a fragile system and the Fildes Peninsula is already a highly impacted place. It can be expected that changes in climate conditions associated with local human activities may disturb the flora, reinforcing the need of understanding the true moss diversity of this region and its relation to other sites in South Shetlands. We would like to acknowledge the financial support of FONDECYT (1140189 GEZ), Proyectos Basales (2017) and Conselho Nacional de Desenvolvimento Científico e Tecnológico (CNPq—Brazil). We are also grateful for the support of PROANTAR (Brazilian Antarctica Program), the Navy of Brazil and MCTIC (Ministry of Science, Technology, Innovation and Communication of Brazil). 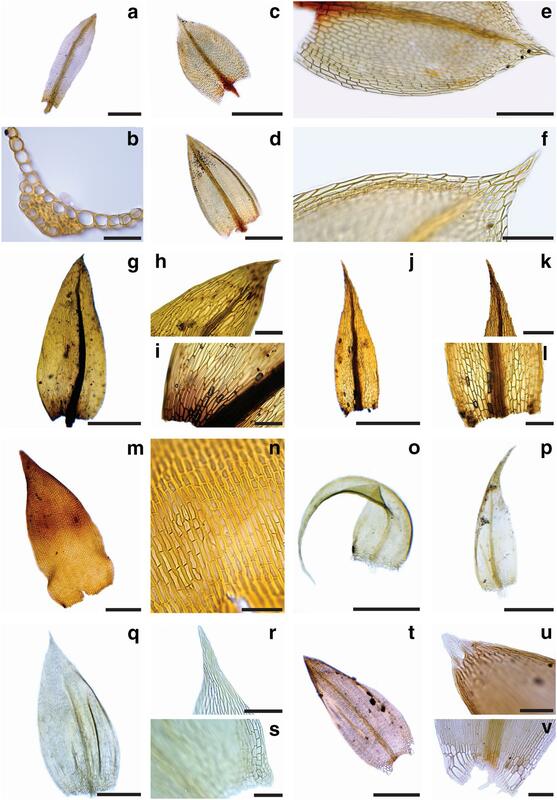 The samples of species mentioned in this article are deposited and available in the Herbarium of Universidade de Brasília (UB), Brazil. Funding was provided by Fondo Nacional de Desarrollo Científco y Tecnológico (FONDECYT—1140189 GEZ), Proyectos Basales (2017) and Conselho Nacional de Desenvolvimento Científico e Tecnológico (MCTIC/CNPq—Ação Transversal n° 64/2013). DKH collected and identified the samples, helped writing, illustrating and revising the manuscript. BGCS assisted in collection and revision of manuscript. GEZ provided the logistics and equipment in Fildes Station for collections and identification of samples and revised the manuscript. PEASC is the coordinator of Brazilian project “Evolution and Dispersion of Bipolar Antarctic Species of Mosses and Lichens” from where this paper originated, he wrote the manuscript, as well as collected and identified samples. All authors read and approved the final manuscript.